I am so fascinated with the question of what becomes of vessels (shells, bottles, jars, and more) when they no longer serve their original purpose. Do they become things of beauty? Are they simply broken and discarded? 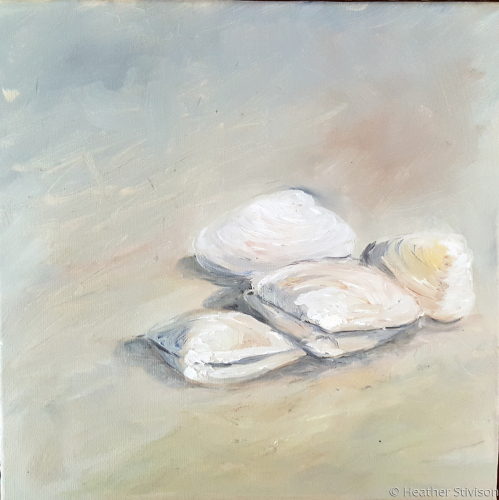 Painting these two tiny shells on an oversized canvas made me think more about their second life, once a home for sea creatures now, an architectural form for humans to contemplate. 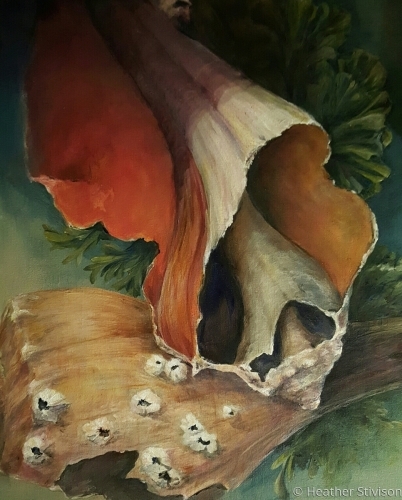 This work was on view at the Southern Vermont Art Center in 2016. The remains of a small (less than two inches long!) shell washed upon the beach near my home. Finding it, I was struck by the thought that this tiny, broken thing in my hand had once been the home of a small creature. 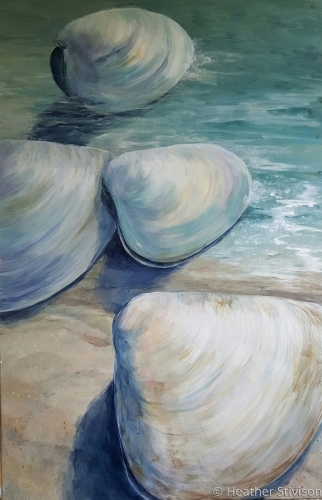 The large scale of the painting is to emphasize this architectural nature of the shell. It was bleached white from the sun, so the colors used are my invention—a home painted in new colors the way a home is often repainted by its new owner. 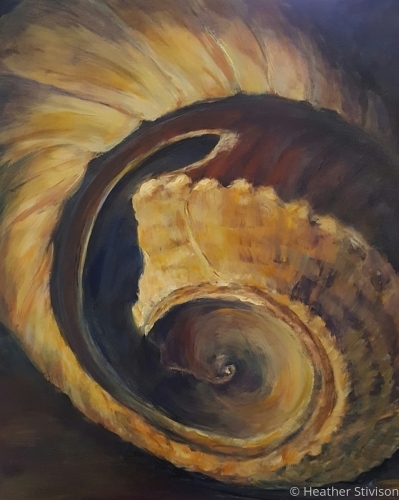 There is something poignant in these beautiful objects that are no longer needed as homes for the mollusks that once inhabited them. These empty architectural forms are not useless detritus. In their new “life-stage” they have new purposes in the coastal ecosystem. Barnacles, algae, sponges, and seaweed grow on their surfaces. Even as the shells are battered into smaller pieces they are needed to prevent beach erosion. Eventually they become the sand itself. 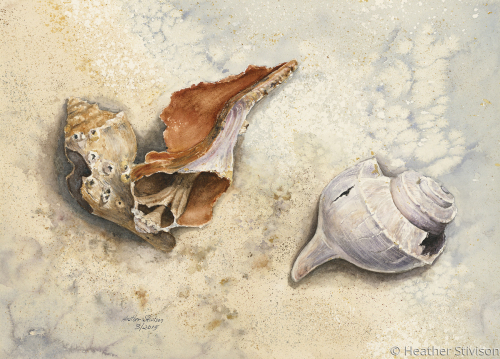 Seashells—literally the empty skeletal remains of ocean life are the subject of this watercolor. They are on a textured background, created almost entirely without the use of a brush. 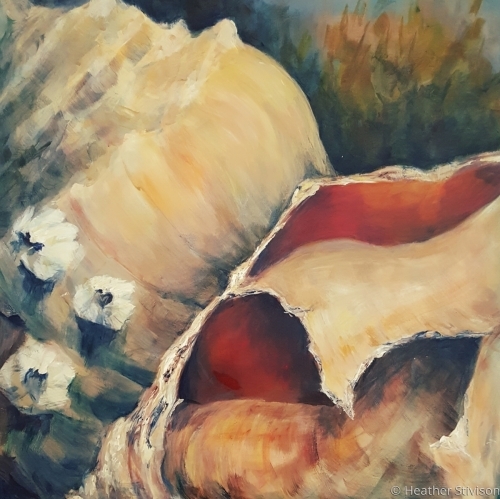 The shells themselves are carefully rendered, not as perfect specimens, but rather in their broken and battered conditions. To me, these time-worn “remains” of life display a new kind of intricate beauty and integrity. This work was on view in a South Coast Artists Invitational exhibition at Gallery X, New Bedford, Massachusetts in May 2016. 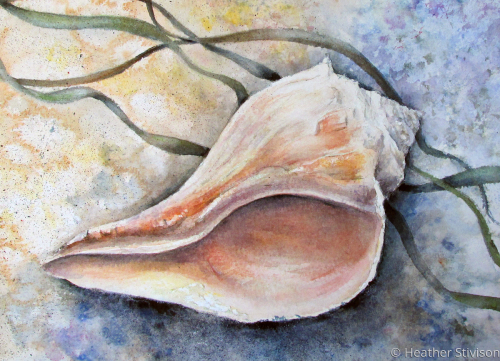 A smaller version of this painting is available as a signed and numbered Giclee print. Click here to see print purchase options.